FREMONT, Ohio – First it looked like Sheldon Haudenschild would drive to his 6th University of Northwestern Ohio All Star Circuit of Champions Sprint Car Series win at Fremont Speedway Friday. But, he spun with nine laps to go handing the lead to Cole Duncan, who scored the win at “The Track That Action Built” the previous week. But, Duncan would jump the cushion in turn four with three laps to go, handing the lead to Aliquippa, Pennsylvania’s Tim Shaffer and the “Steel City Outlaw’ would drive to his second series win of the year at Fremont Speedway to open the 8th Annual Jim Ford Classic. For Shaffer, a four time All Star champion, it was career win #56 with the series, tying him with the hall-of-famer Jack Hewitt for fourth on the All Star’s all-time win list. It was Shaffer’s second All Star win of 2015; the other coming in May at Fremont. Shaffer now has 15 career wins at Fremont Speedway, of which, 10 have been All Star victories. “I have to thank Scott Gressman and those guys….they give me great engines. We have five-o here and James and Todd Grace has really been behind me all year…he’s really helped me out a bunch. It’s pretty awesome to have someone behind you and racing with you…he turns the wrenches on it and I just drive it,” said Shaffer beside his Bryan Grove Racing, Canton Erectors, VRP Shocks, Helms and Son Excavating backed machine. “It’s amazing….I don’t know what it is but this place has always been good to me. It’s a lot of fun for me to race here. Todd was yelling at me on that yellow to go to the top in turns three and four with the big curb….with the way the car was, it worked out great,” added Shaffer of his win on All Pro Aluminum Cylinder Heads Night. Duncan would bring his Motor City Auto Transport, Industrial Special Powder Coating, Wolfden Products, CnB Chubby Mushroom Farms #22 home in second. Dalton, Ohio’s Lee Jacobs has struggled the past couple of months so a third place finish was just what the doctor ordered. “This was like a hometown track for me for a lot of years. To come back here and run good is something great for us. We split ways with our crew chief right after Knoxville and I’m back to having fun in a race car again. I’m doing everything on my own and making phone calls to figure out what I need to do to this race car. Our results a couple of weeks ago didn’t show how really good we are. We’re going to push to win $10,000 tomorrow,” said Jacobs beside his Amanda Lewis Attorney at Law, Simcox Grinding and Steel, Crown Investments backed #81. In the Fremont Federal Credit Union 305 Sprint feature, Fremont’s Dustin Stroup would hold off a charging Bobby Clark for his first career win at “The Track That Action Built.” A couple of months ago it looked like Stroup was done racing for the year after blowing the engine in his 360 sprint ride. But, Kenny Meggitt stepped forward and gave Stroup a 305 engine to run and the results have been fantastic as this was his third win since the move (two came at Attica Raceway Park). “This is amazing. We’ve had a lot of bad luck racing 360s and blew a motor at the King’s Royal. I had Kenny Meggitt gracious enough to give me a motor and we’ve picked up three wins in a short amount of time. I have to thank everybody who has a hand on this thing…Westway Farms, my mom and dad, my buddies Adam and Reed, Slade Shock Technology, Advanced Autoparts and Daniel Miller Cement Finishing,” said Stroup. “I really hate this scoreboard because I look at it a lot. On that last caution I didn’t look up at it so I didn’t know who was behind me. But, when we took the white flag I saw a white car shove his nose in coming off of two. I was like I had better get going in three and four if I’m going to win this thing,” added Stroup. Fremont’s Matt Foos would take the lead on lap three and survived a couple of late race cautions to drive to his fourth win of the year at Fremont in the AAA Ohio Auto Club Dirt Trucks. It was his sixth career Fremont win and the eighth total for the season as he has four at Attica Raceway Park. “I was riding the brakes pretty good getting into one. I had to run the bottom…the cushion was pretty tricky for me in one. What a season,” said Foos beside his Fremont Fence, Automatic Fire Protection, M&L Excavating, Pit Stop Convenience Store, CA Kustoms, D&R Transmissions backed #2. Sheldon Haudenschild and Byron Reed would bring the field to green for the 30-lap All Star feature with Haudenschild gaining the advantage. Haudenschild and Reed would pull away slightly from the great battle for third involving Duncan, Gary Taylor and Shaffer. Haudenschild would set a blistering pace and would encounter heavy lapped traffic by the eighth circuit, allowing both Reed and Duncan to close while Shaffer moved into fourth. Disaster nearly hit Haudenschild on lap 12 as he made contact with Caleb Griffith on the front stretch as he worked to lap Griffith. That would damage Griffith front end and bring out the caution. On the restart Haudenschild could not shake Reed as Duncan, Shaffer, Taylor, Brad Haudenschild, Lee Jacobs and Chad Kemenah stayed close as well. At the half-way point Reed had closed to within a car length of Sheldon Haudenschild. The leaders would once again race into traffic on lap 19 with Sheldon Haudenschild leading Reed, Duncan, Shaffer and a closing Kemenah. After completing lap 21, Sheldon Haudenschild would spin in turn one, collecting Reed and handing the lead to Duncan. On the ensuing restart Brad Haudenschild would bring out the caution while all eyes were on Christopher Bell who had worked his way to 10th from his 24th starting spot. When the green flew Duncan would lead as Shaffer and Kemenah battled for second, which would result in contact with Kemenah spinning, which also collected Bell. Duncan now led Shaffer, Taylor, Jacobs, Danny Holtgraver and a closing Cap Henry who had started 16th. Jacobs would take the third spot on lap 24 as Duncan now had his hands full with Shaffer. Shaffer would continually run to Duncan’s inside and as they raced into turns three and four to complete lap 28, the pressure would cause Duncan to slide over the curb in turn four, handing the lead to Shaffer. Shaffer would drive away the final three laps to score the win over Duncan, Jacobs, Henry and Taylor. 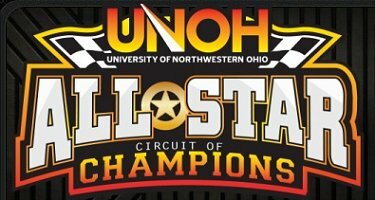 Current UNOH All Star point leader Dale Blaney would advance five spots to finish sixth with Dean Jacobs coming from 15th to a 7th place finish, while Sheldon Haudenschild would storm back to finish 8th with Greg Wilson advancing 11 positions to ninth and Holtgraver rounding out the top 10. Kyle Farmer and Seth Schneider would pace the field for the 25 lap 305 sprint feature but Farmer would get sideways on the start and a six car melee would ensue leaving Schneider and Brian Gibbs upside down. When the crash scene was cleared and the green flew Stroup would power into the lead over John Ivy, Brandon Moore, Dustin Dinan, Alex Paden and Kyle Capodice. After two laps were recorded Dustin Rall would bring out the caution. When the green reappeared Stroup would lead Ivy, Moore, Dinan, Capodice, Bobby Clark, Thomas Schinderle, Paden and Luke Griffith. Following a Paul Weaver spin on lap five, Stroup would start to pull away as Ivy had his hands full with Moore. By lap 12 Stroup had a three second lead over Ivy as Clark moved into third with Moore and Alvin Roepke – who went to the tail on the start because of a tire change. Stroup would race into heavy lapped traffic by lap 16 which allowed Ivy and Clark to close. Roepke would take fourth on lap 17. With five laps to go Farmer would bring out the final caution. On the restart both Clark and Roepke would get around Ivy and as the white flag flew Clark showed Stroup his nose. Stroup would hit his marks in turns three and four and would take the win over Clark, Roepke, Ivy and Moore. Jeff Ward and Jimmy McGrath brought the field to green for the 20 lap dirt truck feature with Ward gaining the upper hand over Foos, McGrath, Brad Mitten, Brad Stuckey, Gene Potridge and Keith Sorg. Cory Ward would bring out the caution and on the restart Andy Earnhart, Bryce Black and Cory Ward would get together. When the green flew Foos immediately pressured Jeff Ward with a tremendous battle involving McGrath, Mitten, Stuckey, Potridge, Steve Endicott, Shawn Valenti and Kent Brewer going on. Foos would take the lead on lap three and pulled away from the 6 truck battle for second. Black would bring out the caution on lap seven, which would keep the field close to Foos. But, when the green flew so did Foos, pulling away to a commanding lead. At the half-way point Foos was in command while Jeff Ward, McGrath, Mitten and Valenti battled for second. Cody Benyak would bring out the yellow on lap 13 and a lap later McGrath would spin. When the green flew Foos again pulled away as Jeff Ward, Mitten, Valenti, Cory McCaughey, Brewer and Stuckey battled. Valenti would move into third on lap 17 and drove around Ward for second a lap later. But by then Foos had checked out and he would drive to the victory. Valenti, Jeff Ward, Mitten and Brewer would round out the top five. Fremont Speedway will wrap up the 8th Annual Jim Ford Classic Saturday (rain date of Sunday) with the UNOH All Stars going 50 laps for $10,000 to win. The 305 sprints and 602 late models are also in action.